A water tower on the horizon, threatening storm clouds, rain, cherry blossoms and classical architecture as seen from the third floor windows of the Allen Library. 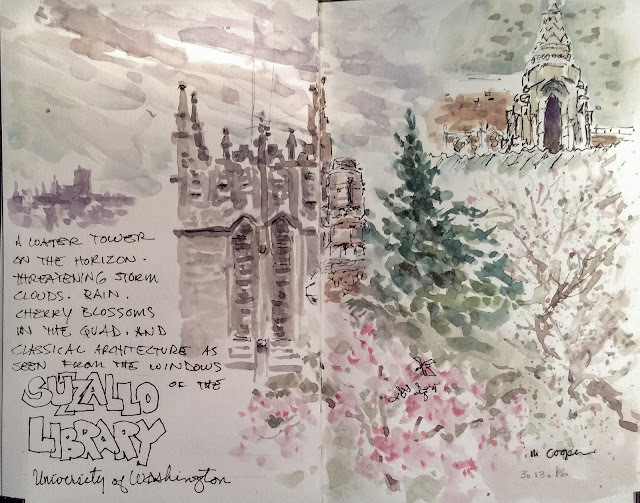 Seattle Urban Sketchers met at the Suzzallo Library on the campus of the University of Washington this morning. Taking advantage of early opening for students studying for finals, many decided to shelter from the rain and chose subjects inside the building. My vantage point was from the third floor of the Allen Library, looking back at a wing of Suzzallo and adjacent buildings. After sharing our sketches, the sun broke through and a few of us walked over to view the cherry blossoms in the quad. My commute northward towards home on I-5 was wild and wet, scattered with fallen tree boughs as I navigated through several squalls. At this moment, we are experiencing extrememely high winds. So high that our star magnolia split and half of it is layng across the pond.